There’s a new report out on the state of America’s bridges, and with it a new raft of disturbing statistics. Nearly one in nine, or 11 percent, are structurally deficient — meaning a bridge inspector has rated a major component of the structure to be in poor condition. The average age of a bridge in the United States is 43 years; the average design life, 50 years. While state DOTs and other transportation agencies have been spending the bulk of their money expanding highways and promoting sprawl, there are 66,405 structurally deficient bridges in the United States. As Transportation for America points out in “The Fix We’re In For,” if you were to string together these aging bridges, they would stretch from Washington, DC, to Denver. A smaller number of these bridges are also “fracture-critical” — in danger of collapse if a major structural element fails. James Corless, director of Transportation for America, said in a conference call today there is a backlog of bridge repair coming due and federal policy isn’t addressing the problem. MAP-21, the current transportation bill, eliminated dedicated funding for bridge repair, making it more tempting for states to spend on road expansion instead of maintenance. The largest federal pot of money available for repairs — the National Highway Performance Program — is open only to the highest class of highways, which encompasses only 10 percent of bridges. The problem isn’t going away. 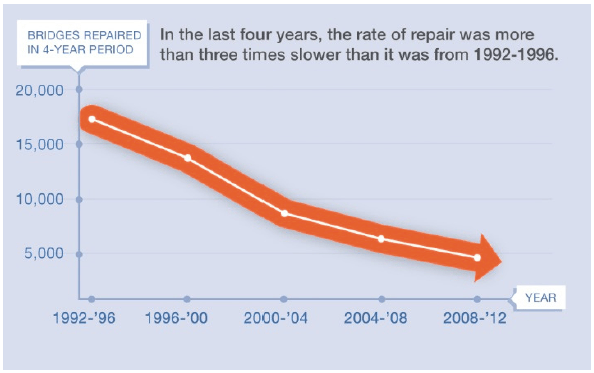 While the proportion of structurally deficient bridges has decreased slightly since T4A’s last bridge report in 2011 (from 11.5 percent to 11 percent, thanks in part to the stimulus bill), the pace of repair is slowing. In 10 years’ time, nearly one in four bridges will be 65 years old, the average age of a structurally deficient bridge. Lynn Peterson, secretary of the Washington Department of Transportation, commented on the findings during a T4A conference call today. She said even though her state rates well overall on bridge maintenance (Washington is the sixth-best in the country with less than 5 percent of its bridges rated structurally deficient), the collapse of the I-5 bridge of the Skagit River last month has refocused her agency on repair. A temporary replacement bridge opened today, less than four weeks after the collapse, which was caused by a truck collision. The bridge was not structurally deficient, but newer bridges are required to have built-in redundancy intended to prevent such a collapse. “It’s always cheaper to do the maintenance of our bridges up front, rather than having to deal with an emergency such as this,” said Peterson. In order to get a handle on the problem, T4A recommends prioritizing repair projects over expansions and removing funding restrictions on bridge repair. Message: stop widening freakin’ freeways and start fixing what’s already there. We’re dumb-asses. We keep expanding without maintaining. That’s guaranteed to blow up in our faces. Jack, the article focused on the condition of bridges, not population growth. Nationally, 11% are structurally deficient. The report lays out the condition of bridges in each state.